UNITED NATIONS, January 18 -- As the UN and its Security Council heaped praise on the government of Omar al Bashir for the Southern Sudan referendum, the UN had no comment on Bashir officials' torture of Darfur activists and detention of (Islamist) opposition figure Hassan al-Turabi. Running to the Security Council stake out, Inner City Press asked Sudan's Ambassador Daffa-Alla Elhag Ali Osman about Turabi's arrest. 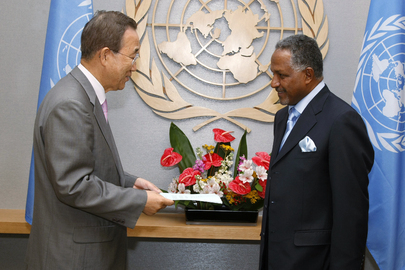 “Let me ask you a question,” Sudan's Ambassador replied, blaming the arrest on a call for Tunisia like demonstrations. Inner City Press asked him why his government had not flown International Criminal Court indictee Ahmed Haroun to Abyei rather than having the UN do it. He first claimed not to know of Haroun's trip. Then to an Inner City Press follow up he said, the UN is not an off shoot of the ICC. When UK Ambassador Mark Lyall Grant took questions some days ago, Inner City Press asked him about the UN Mission in Sudan under Haile Menkerios using a UN aircraft to transport ICC indictee Haroun. I am not going to second guess the UN, Lyall Grant said. So much for overseeing the UN's compliance not only with human rights standards but even the Council's mandates. Inner City Press asked this month's Council president, Bosnia's Ambassador Barbalic, about the UN flying Haroun around, even the Council's Press Statement's reference to holding accountable those responsible for crimes in Darfur. That was not discussed today, he answered and said, I do not have the information. After the Council meeting, Inner City Press asked top UN peacekeeper Alain Le Roy about the UN flying ICC indictee Haroun into Abyei. Le Roy at least acknowledged being aware of the criticism, but said that getting Haroun there to speak with normadic tribes was the focus. But Sudan has its own airforce, which uses to bomb. That Haroun set up a TV interview for the airport at which he landed in the UN plane does not appear to be a coincidence. The UN was used to undercut the war crimes indictments. And the UN says nothing about it. Watch this site.